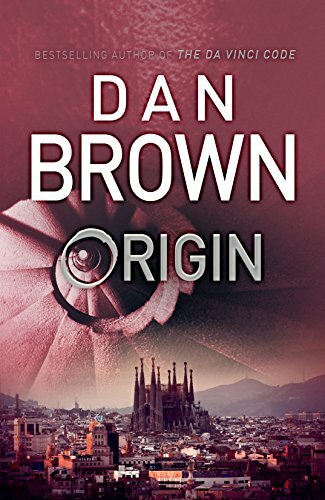 Launch date nears for Dan Brown’s Origin… Read an excerpt from the novel here! October 3 is a red letter day for Dan Brown fans: that’s when The Da Vinci Code author’s latest thriller, Origin, is launched on Amazon. Book 5 in the Robert Langdon series. In, Robert Langdon, Harvard professor of symbology and religious iconology, arrives at the Guggenheim Museum Bilbao to attend the unveiling of a discovery that “will change the face of science forever”. The evening’s host is his friend and former student, Edmond Kirsch, a forty-year-old tech magnate whose dazzling inventions and audacious predictions have made him a controversial figure around the world. This evening is to be no exception: he claims he will reveal an astonishing scientific breakthrough to challenge the fundamentals of human existence. Ironically, they will now be the first to learn the truth, Kirsch thought, wondering how they would react. Historically, the most dangerous men on earth were men of God . . . especially when their gods became threatened. And I am about to hurl a flaming spear into a hornets’ nest. Bishop Antonio Valdespino was a formidable figure in Spain—not only a trusted friend and counselor to the king himself, but one of the country’s most vocal and influential advocates for the preservation of conservative Catholic values and traditional political standards. A noble quest, Kirsch thought, despite seeing it as an empty exercise—a meaningless search for random points of correspondence among a hodgepodge of ancient fictions, fables, and myths. As Bishop Valdespino guided him along the pathway, Kirsch peered down the mountainside with a sardonic thought. Moses climbed a mountain to accept the Word of God . . . and I have climbed a mountain to do quite the opposite. Kirsch’s motivation for climbing this mountain, he had told himself, was one of ethical obligation, but he knew there was a good dose of hubris fueling this visit— he was eager to feel the gratification of sitting face-to-face with these clerics and foretelling their imminent demise. All three men gave nods of tacit acquiescence, which Kirsch knew were probably redundant anyway. They will want to bury this information—not broadcast it. Kirsch reached into his suit coat and pulled out an oversized smartphone—one that he had designed and built to serve his own unique needs. The phone had a vibrantly colored mosaic case, and he propped it up before the three men like a television. In a moment, he would use the device to dial into an ultrasecure server, enter his forty-seven-character password, and live-stream a presentation for them. The Kindle ebook, paperback and hardcover versions of Origin can be pre-ordered via Amazon now. The ebook will be auto-delivered to buyers’ Kindles on October 3. Origin’s pending release follows in the wake of today’s launch of Nelson DeMille’s latest thriller, The Cuban Affair. Other notable thriller novels to be launched in the coming weeks include John Grisham’s The Rooster Bar (October 24), Michael Connelly’s Two Kinds of Truth (October 30), David Baldacci’s End Game (October 31), Lance and James Morcan’s Silent Fear (October 31) and Lee Child’s The Midnight Line (November 7). As was the case with DeMille’s The Cuban Affair, these novels are all available now as Kindle ebooks on Amazon’s Pre-order program.